It came from the sky, but how it got there is anyone’s guess. George Bearse was at his home on Callander Crescent in Alliston Saturday afternoon when his wife heard a loud thud outside their home. As a former member of the Peel police bomb squad, any sudden noise automatically causes his ears to perk up. 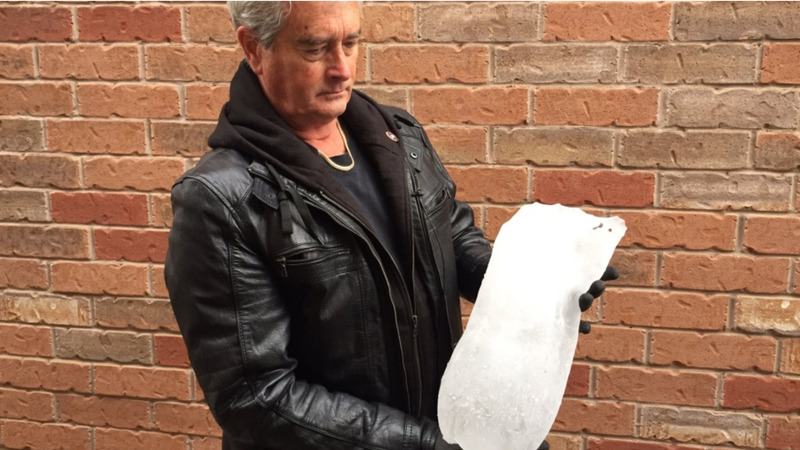 So he went outside to investigate and discovered an odd-shaped chunk of ice that had seemingly crash-landed on the gravel walkway between his and the neighbour’s home. The object was about a foot and a half long, weighed five pounds and had an elongated aerodynamic shape, almost like a missile. He looked up in the sky to try to make sense of where it could have possibly come from, but the scattered clouds drifting above didn’t offer up any answers. He said there was also no visible ice build up on either roof that could have caused this. Bearse was relieved it landed where it did. “If that hit anyone on the head, it would have taken them out,” he said. Things could have also been much different if it landed just a few feet to either side. “The roofs here are just shingles with one layer of plywood underneath, so I think this would have gone right through it,” he said. Unsure of whether other pieces of ice may have fallen in the area, Bearse picked up the ice and stored it in the freezer. “I secured it just in case (there were) calls about it,” he said. From a weather standpoint, the object is definitely a mystery, said Dave Phillips, senior climatologist with Environment Canada. He said the area didn’t experience weather events that could have caused an object like that to go airborne. He said an aircraft is likely the only other explanation, noting there have been examples of this reported before in weather news stories. Transport Canada has not received complaints of falling ice in Alliston, but it encourages residents to report incidents of falling objects from aircraft while in flight. She said the Canadian Aviation Regulations prohibit aircraft from dropping objects that create hazards to people or property. An operator that does so is subject to enforcement action.